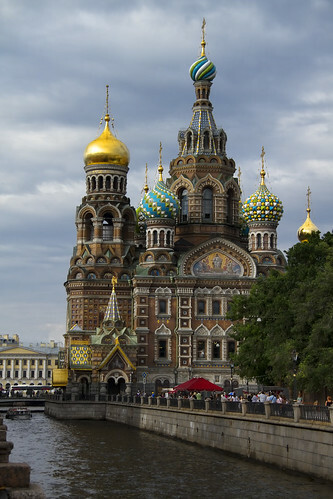 The Church of the Savior on Spilled Blood is one of the most beautiful churches in St. Petersburg, Russia. With its colorful onion domes, it reminds me of St. Basil's in Moscow. If you've followed Downey Daily Photos for any length of time, you'll know that we like to photograph old churches, so these beautiful churches in Russia have been great fun. This church was built on the spot where Emperor Alexander II was assassinated in March 1881. St. Petersburg is so far north that it doesn't get dark until at least midnight. (It's 11:30pm as I type this, and it's still dusky out.) The nearly-round-the-clock daylight is called the "white nights" of St. Petersburg. The weather has been in the 80s (Fahrenheit), but somehow the sun feels much warmer than that. These men were enjoying the sun along one of the St. Petersburg canals at about 6pm this evening. The church certainly looks very beautiful .. good shot.